Posted on November 10, 2014 by I Never sign out at work. We finally got round to building our home wall. With our flat only being rented we had the challenge of having to build a wall that is completely free-standing and has no effect or damage on the walls or floor of the flat. With Euan already having a simple frame and plywood front from his old wall we came up with the idea of an A-frame structure that would hold this pre-made wall at a steeper angle and would keep the wall totally free standing and stable. We set about cutting the wood to shape and began the construction. Our idea was to use large bolts for the joints at the top and bottom of the wall so that the whole thing could be pushed up and effectively ‘folded’ away to create more space. When the wall is to be used, we would pull it down and the supporting legs would slot into place holding it securely. Remarkably it all went together as planned and without too much hassle. We calculated the angle (had to remember my higher maths there) once it was fully built and to our surprise found it to be 42 degrees from the floor! (steeper than a 45 training board! )…a little steeper than we’d anticipated! Well I guess if anything it’ll make us stronger…or injured. Posted on November 8, 2014 by I Never sign out at work. 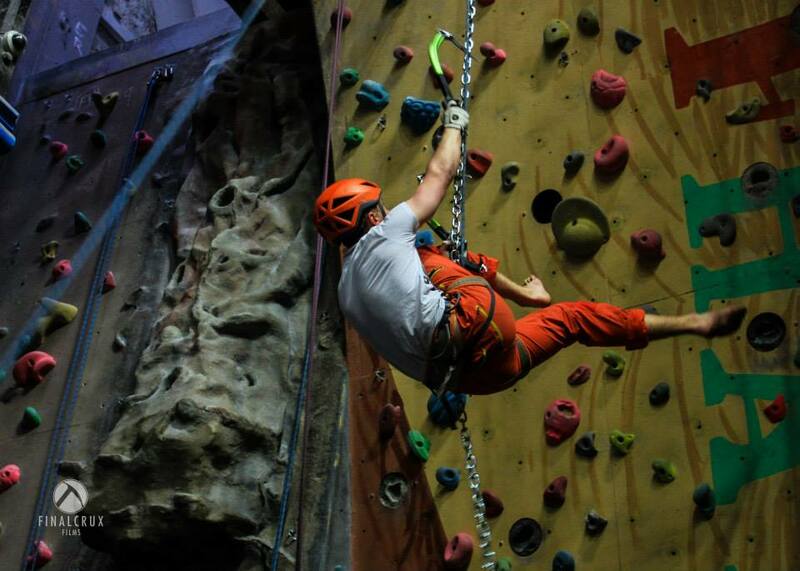 Today was the third round of the British Tooling Series, held at the Glasgow Climbing Centre. I haven’t competed in any of the other rounds so far due to lack of free time to travel to the venues down south. Fortunately, Glasgow being my local venue and work place, I’d had plenty of notice of the date of the event and had subsequently been training hard on our new home wall specifically for the event. I felt like I was at my strongest I’d been this year since my time off through the summer and so my confidence levels were high. Something I’ve always found to be a big factor in the way you actually perform in an event, be it relaxed or a competitive one. The competition was made up of 15 routes for the qualifiers. You had four hours to go off and try them in whichever order you wanted and then a final route for the top 4 climbers in each category to battle it out on for the win. As usual the route setters didn’t disappoint with the quality and imagination within the routes, using obstacles from 30ft logs and chains to gnarly slopers set at the imperfect angle! I decided to start on the large 30ft vertical log climb as I knew it wouldn’t be too technically difficult, only requiring sharp axes and good striking technique and would also provide a good warm up for the other routes. The whole log was suspended several feet from the floor to make in unstable which gave some interesting leg wrapping technique to shuffle your way up. As expected I topped the route without too much difficult (or too many splinters!) and sounded the comically high pitch horn that hung from the top that signalled topping the route. I blasted through some of the easier routes to chill out for a bit and avoid being left with them to do at the end so that I could focus purely on topping the harder routes with as little attempts as I could. 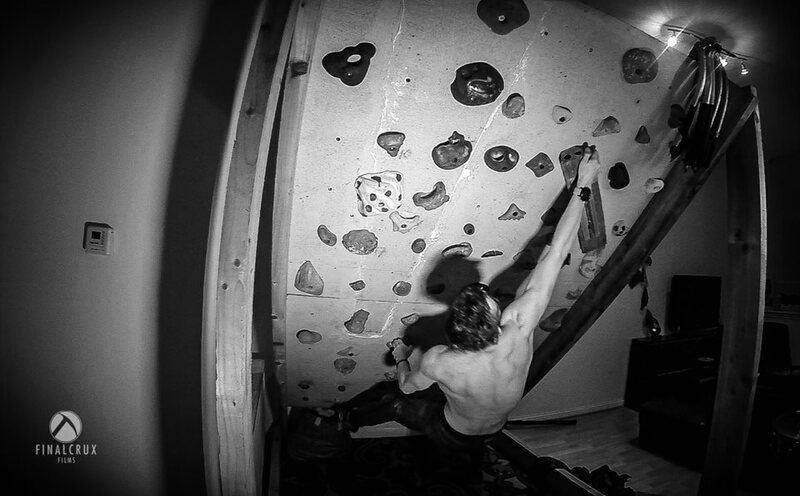 I had an attempt at one of the harder, more delicate climbs that was made up of large moves between insecure and marginal placements that ended abruptly as I moved into the top third of the route when a hold broke in half on me. I was a little disappointed that on my first attempt when i was doing so well ended because of something beyond my control but at least I knew I could do the route and went for a break to come back to it later. Having topped all but two routes so far first-time (including some of the hardest routes that I’d seen kicking off some of the other strong climbers, such as the vertically hanging chain requiring good fig-four practice or a lot of lock off strength), I went back to try the route that I’d previously failed on due to the broken hold for another try at my first attempt (falling due to a broken or spinning hold is not counted as a failed attempt). I tied in and placed my axes onto the starting hold and moved off it attempting to start climbing to my previous high point on the route. With the route having seen some traffic since earlier the first few holds had been chiseled down a bit and weren’t as secure as early. My axe instantly ripped from the hold and I was lowered to the ground having only managed 3 moves. What a disappointment, I knew I had already climbed the first two-thirds of the route before and to lose out on the available points for my first attempt meant I’d possibly just lost my upper hand of having topped everything else first go. 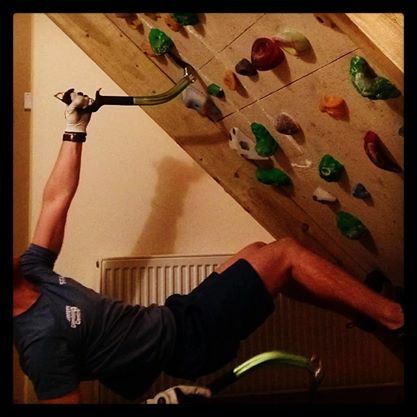 I Finally managed to top the route on my last available attempt to gain at least some points for the route. Unfortunately I didn’t manage to make it into the final, missing out on qualifying by only 5 points (That damn broken hold!!) and finished up 6th. All in, the day was a great success. 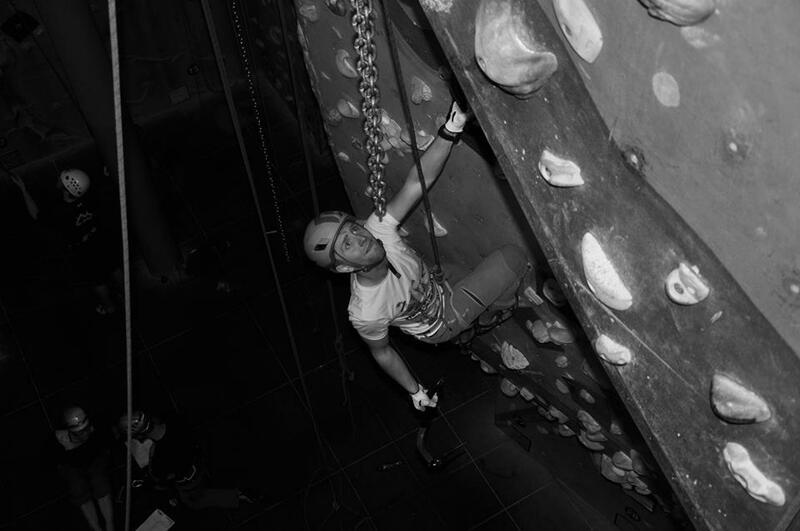 Everyone enjoyed the event and the finalists truly deserved their places with the brilliant efforts on the gnarly looking final routes. It was great fun and I felt like I’d climbed better than I have in previous years and that the training I’ve been doing is paying off. More than anything I’m now super psyched for the winter to hurry up and arrive and feeling confident that I can crush some hard routes. Posted on November 18, 2013 by I Never sign out at work. Yesterday I headed back to Newtyle quarry with my friends Tim and Finlay. Meeting up at half 8 we all packed into the small Fiat to escape from the morning cold, dressed accordingly with our bright soft-shell trousers, down jackets and axe Wielding rucksacks. We must have been some spectacle to those passers-by missing out on a lie-in to grab their morning paper, paracetamol and the other Sunday morning essentials. Arriving at Dunkeld, slightly later than anticipated (thanks to Finlay’s ‘Detour’!) but non the less within good time and with a bright and full day to climb ahead of us. We grabbed our kit and took the narrow path away from the road towards the crag. We soon realised all three of us had relied on the others to bring the quick-draws to protect ourselves on the easier walls at the entrance of the quarry, so decided to head straight to ‘the tube’ that is equipped with in-situ draws. ‘The tube’ is the remnants of the blasting from when Newtyle was an old slate quarry. 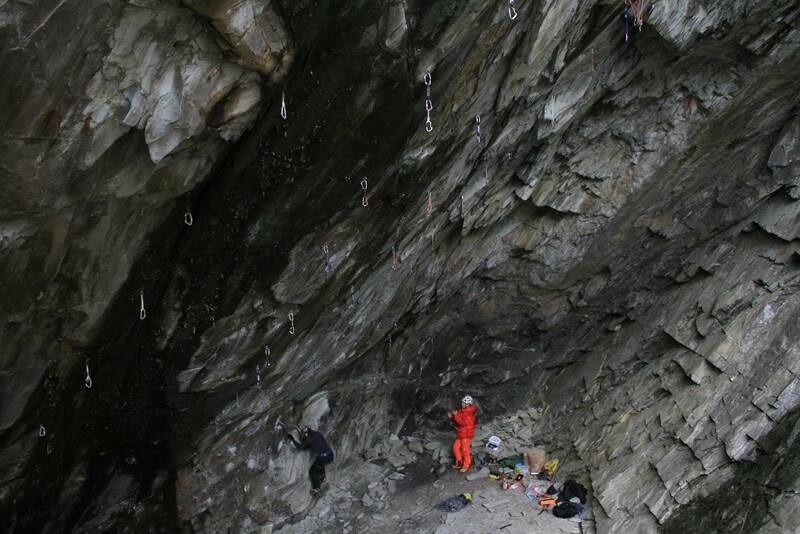 Left behind is a deep cavern of smooth overhanging walls tunnelling deep into the hillside that has been transformed into a drytooling Mecca by resin bolts and drilled pockets. We soon got started on ‘Fast and Furious’, a D10 test piece that takes the furthest right line of bolts across the roof of the cave. 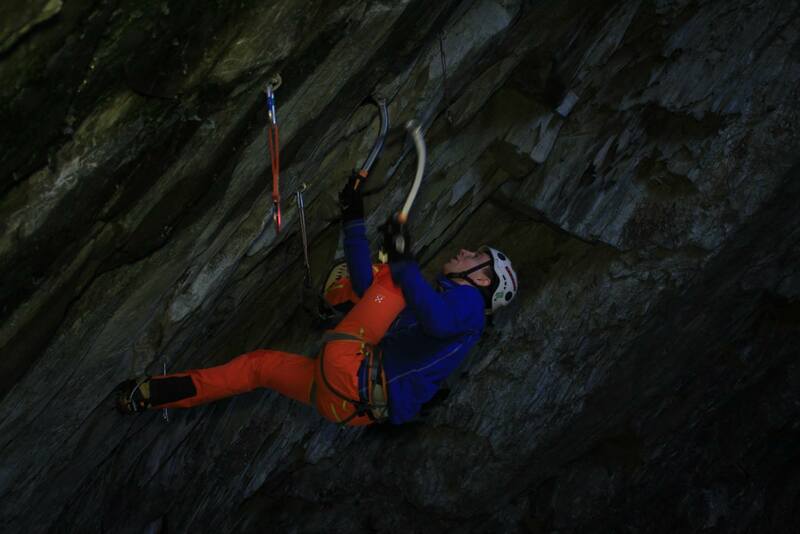 Having been to Newtyle a few times before, I had tried all the moves and started to link them together on several redpoint attempts, we thought it best that I jumped on the route first for my warm up and so that the others could learn some of the moves. As I got through a fair part of the route before feeling any sense of fatigue I realised I was feeling pretty strong today and that I might be in with a good chance of topping the route out on a later attempt when fully prepared and warmed up. Tim and Finlay both learnt the moves pretty quickly on their first attempts and made some fair progress up the route. Tim managed to top the route out, taking a few rests just to verify the beta and correct any mistakes, a pretty strong effort as it had taken me several attempts to even work out how to climb the top section on my first visit. Finlay struggled a little with moving off of some of the shallow pockets on the first section of the route. Never dry-tooling before and having to jump on a powerful D10 for your first route requires some amount of enthusiasm. Taking it all in his stride, Finlay jumped on the route happily taking the fall from the first clip a few times as he learnt to trust his axes and started to work the moves through the beginning section. We all untied, sat down and relaxed as we stopped climbing to grab some lunch. With the pre-clip in, (it’s a potential 7m fall from a figure four otherwise!) I started up the route. I Cruised through the several treacherous beginning pockets and onto the middle section where the meat of the route is found. Within this section lies several fig fours, numerous axe swaps and hand stacks, the routes gradient is turned up a notch and continues to increase every meter you climb, and the footholds become non-existent. Put simply, if you mess up one move, your probably coming off. Pushing through this section and without making a single mistake so far I could taste success before it was guaranteed. I feel my arms start to burn, my mind panics and I begin to rush. “Three draws to go. Three moves, that’s all. But They’re the biggest in the route! Shut up and relax.” I think to myself. I focus my mind and blank the pain of my exhausted muscles battling to reduce the pump. My crampons scratch at the rock, looking for any minuscule feature to push off. they stick, I’ve found something. I push my body to full extension and raise my axe to make the first of the three moves. That’s it, the worst is over, the climbing done, just to clip the chains. I’m The height becomes irrelevant and the cave disappears before me, everything shut out of sight apart from my hand as it raises the rope to the clip. As i Struggle I hear my friends shout frantically in the background, wanting it almost as much as I do. It’s not enough. I have nothing left, with my muscles spent, my hand relaxes. I’ve let go. I’m falling. It’s over.